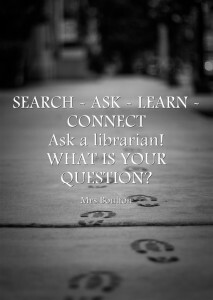 Term 2 is focused on asking questions and what it means to ask questions. Students have been asked to ask me their questions (about anything) and I will endeavor to find an answer. Part of this process will be also demonstrating my research to find this answer (or answers). As a PYP school we encourage students to ask their questions and to direct their own inquiry. One concept based on student questions is the PASSION PROJECT and GENIUS HOUR. Jamie Mackenzie has many books and blog posts about types of questions and how to formulate the right questions. This is the link to his QUESTIONING TOOLKIT. This approach to developing effective questions is often coined as ungoogleable and it is essential that we support students “move beyond the cut and paste“.